When it comes to finding a perfect Mother’s Day gift, there are tons of options to choose from. From aprons to napkin holders, there are gifts that are nice but aren’t much of a use. 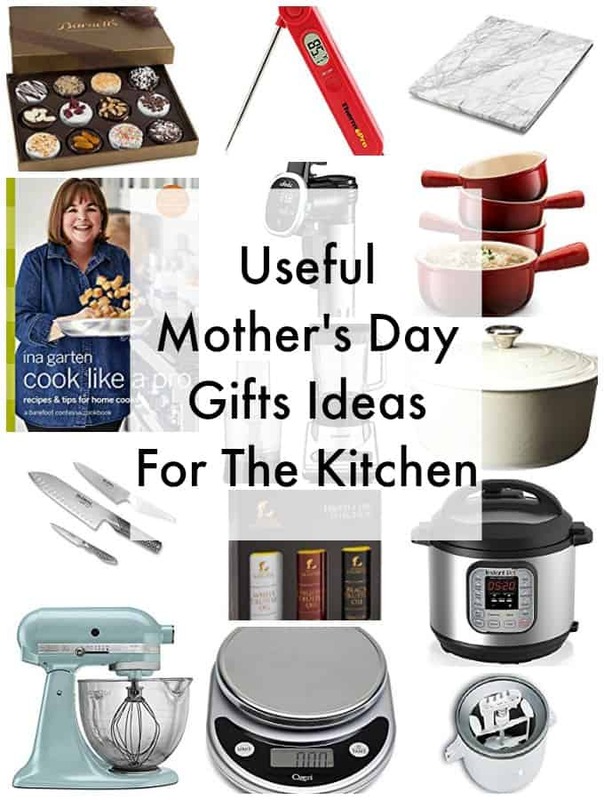 Luckily, I’ve gathered some great gift ideas that are actually useful and are sure to please any mom. Instant Pot – Pressure Cooker, Slow Cooker, Rice Cooker, Steamer, Sauté, Yogurt Marker and Warmer in one convenient kitchen gadget. Programmed to cook recipes up to 70% faster which is perfect for busy weeknights. – love Ina. All of her recipes are so delicious, flavorful and affordable.
. Some of my most popular recipes like Mustard Chicken were prepared there. Any mom would be happy to receive a gift like this. Ceramic French Onion Soup Bowls – these can be used in so many ways. Apart from French Onion Soup, these bowls are perfect for Shepherd’s Pie, Chowders, Lobster Bisque, Puddings and so much more. Blender And Food Processor Duo – one of my most used kitchen gadgets in the kitchen. From pureeing soups, to making smoothies and Pesto sauce, this device does it all. Sous Vide Cooker – new revolutionary way of preparing food. It won’t let you overcook your food. Ensures perfect doneness of meat and also suitable for cooking all kinds of recipes from meat and pasta to vegetables and desserts. Sur La Table Marble Pastry Board is perfect for making bread, pasta, pizza dough or delicate pastries like croissants. Chefs Knives – because every home cook has to have these in the kitchen. – adds a final touch and incredible flavor to any recipe. Instant Read Thermometer – another kitchen gadget that I use on a regular basis. Ensures that food is always at the right temperature. Food Scale comes in handy when you’re measuring baking ingredients or trying to control your portion size. – must-have in every kitchen. Ice Cream Maker Stand Mixer Attachment. This is my favorite Kitchen Aid attachment because making homemade ice-cream is so incredibly easy and it always comes out perfect. Here you can make ice-cream, gelato or sorbet.